We’re going to show you how to make a cheese board! They’re very easy to make and are always a delicious low carb, crowd-pleasing appetizer. We’ve all seen those gorgeous, elegant cheese boars on Instagram, right? Those talented IGers always make them look so easy to make! Well, we’re going to show you that it actually is easy to make your own stunning cheese board at home. And best of all, it requires minimal effort, but looks impressive; all your guests will be oohing and aahing at your next party! And perhaps best of all, a cheeseboard is an easy crowd-pleasing item to keep keto-friendly! 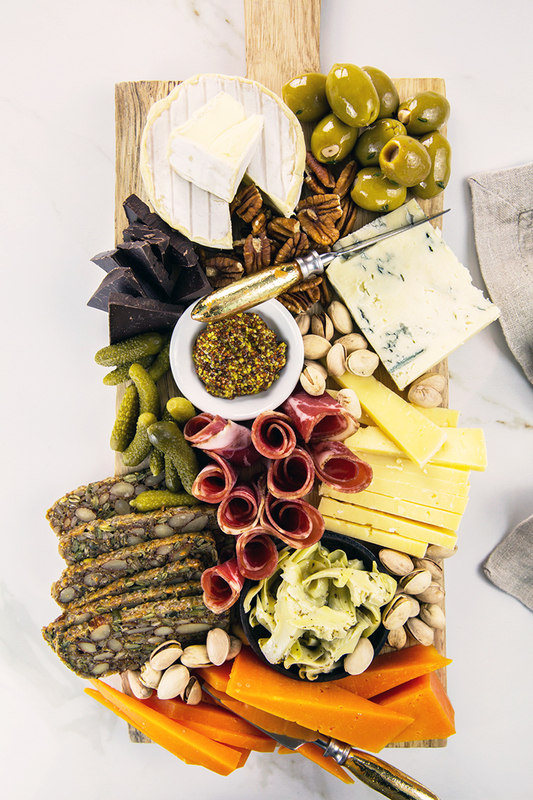 Get ready because we’re going to show you the best cheese board ideas. What Do You Put on a Cheese Board? We have a ton of cheese board ideas for you! The best platters always have a lot of variety, right? 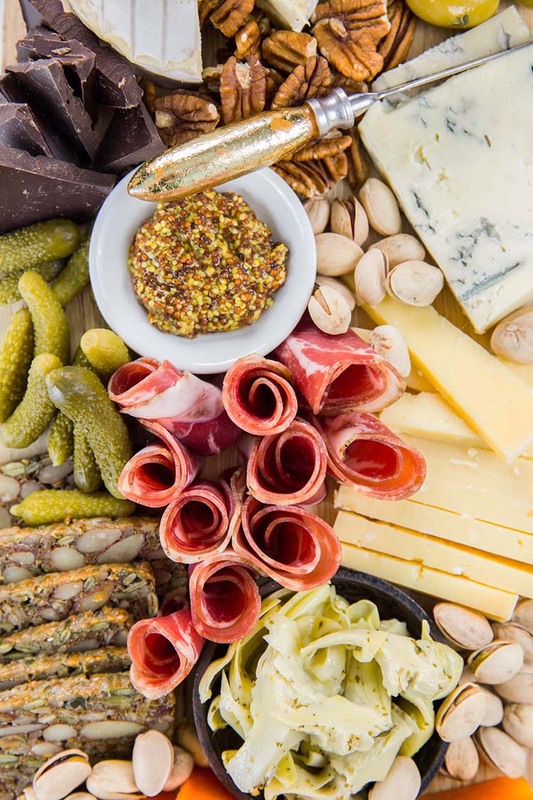 From cheese, to charcuterie, to salty and sweet things, creamy and crunchy components, and condiments, we like to include a little bit of everything. For starters, we recommend including at least four different kinds of cheese. To keep your cheese board interesting, look for cheeses that have different textures and flavor profiles. For example, on a cheese board we might include the following four cheeses: Gorgonzola Dolce, Brie, Cheddar, and Comté. Or we might include Humboldt Fog, Camembert, Gruyère, and Manchego. The possibilities are endless, so use what you love! Just be sure to pick a variety of soft and hard cheeses, as well as fresh and aged cheeses so there’s something for everyone. What Are the Best Cheeses for a Cheese Board? What Food Do You Put on a Charcuterie Board? 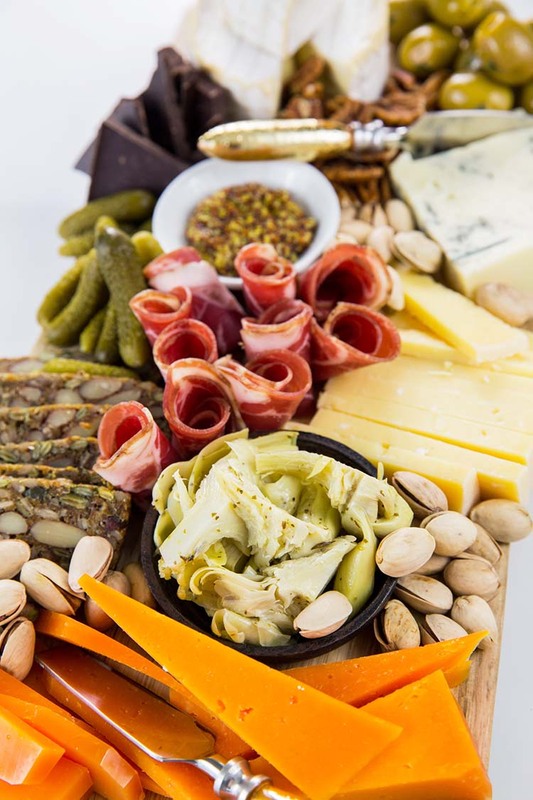 Charcuterie is a French word that refers to prepared meat products, such as sausage, bacon, ham, pâtés, etc. 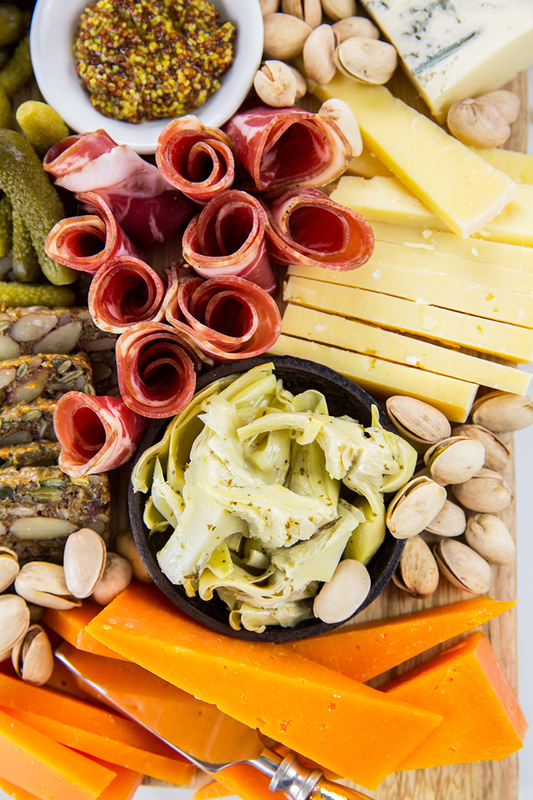 Therefore, a charcuterie board typically contains a variety of meats! Many traditional charcuterie board components are pork-based, however, I don’t eat pork (Faith here! ), so I also enjoy beef and turkey products on a charcuterie board. What Cheese Goes with Charcuterie? 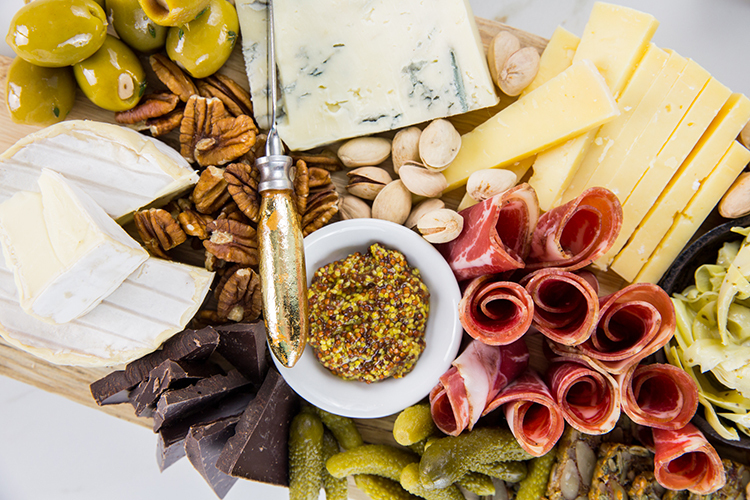 You can pair hard or dry cheeses with charcuterie. If in doubt, sample a little piece of the meat together with the cheese that you want to pair it with and see if it tastes good! Olives, cornichons, and other pickled vegetables, such as artichokes, red bell peppers, etc. A few different mustards, such as whole-grain, Dijon, etc. We love your ideas! 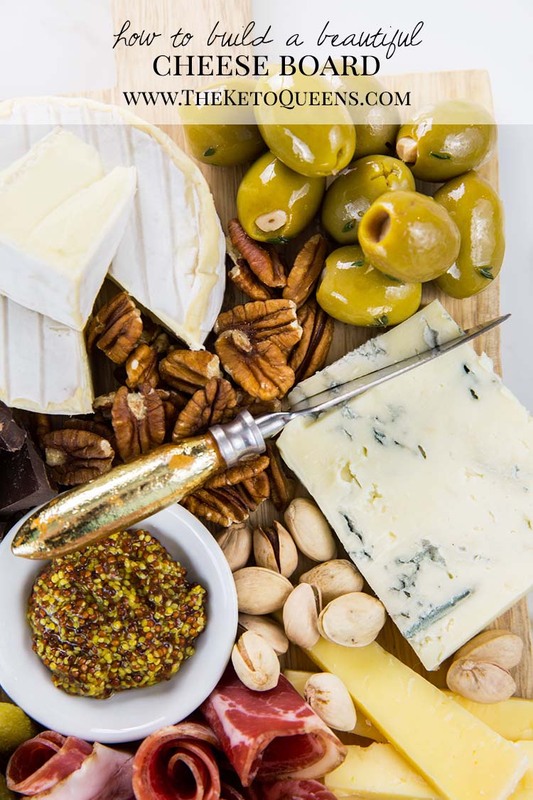 What are some of your favorite things to include on a cheese board? Tell us in the comments below!